Capsule Summary: Hawkeye is blinded after trying to fix the stove in the nurses’ tent and may not recover his sight. Meanwhile, Frank sneakily bets on baseball games. If you’ve never seen this episode, you could be forgiven for reading the brief summary and assuming it’s nothing more than a gimmick episode. Hawkeye goes blind? That sure sounds like a gimmick or, a contrived plot device intended to introduce tension that by necessity will be cleared up by the end of the episode. Is there anybody who watches “Out of Sight, Out of Mind” for the first time and actually worries Hawkeye may actually be blind for life? I doubt it. Yet somehow it works. And it works well. Never does it actually feel like a gimmick. Yes, the stove exploding in Hawkeye’s face is a little contrived. Yes, we all know he’s going to make a full recovery. This isn’t an episode about a character being blinded or a character facing the prospect of a life without sight. It’s about a character learning what it’s like to be blind, even if it is just temporary. With one or two exceptions, the episode shies away from discussing the prospect of Hawkeye being blind forever. Tom Straw brings up the fact that Hawkeye may not be able to continue doctoring and later B.J. suggests Hawkeye is acting manic in an attempt to keep his mind off what might happen when the bandages come off. But there’s no discussion of Hawkeye being sent home or having to be replaced at the 4077th. It’s as if the entire camp is holding its breath, crossing its fingers, and otherwise ignoring the very real possibility that Hawkeye may never see again. “One part of the world has closed down for me but another part has opened up. Sure, I keep picturing myself on a corner with a tin cup selling thermometers but I’m going through something here I didn’t expect. This morning I spent two incredible hours listening to that rainstorm. And I didn’t just hear it, I was a part of it. I’ll bet you have no idea that rain hitting the ground makes the same sound as steaks when they’re barbecuing. Or that thunder seems to echo forever. And you wouldn’t believe what– how funny it is to hear somebody slip and fall in the mud. I bet– it had to be Burns. Beej, this is full of trapdoors but I think there may almost be some kind of advantage in this. I’ve never spent a more conscious day in my life. It’s a famous cliche, the idea that losing one sense heightens the others. Hawkeye doesn’t come right out and say he can hear better because he’s blind but not being able to see has made it possible for him to experience a rainstorm rather than simply observe it. Frank’s B story is silly but grounded in the absurdity of the character. I think it works well because it ties into Hawkeye’s A story. The scene in which Hawkeye, B.J., Radar, and Klinger fake the baseball broadcast is a great one, although I’m not sure how they were transmitting to Frank’s radio. Hawkeye describes his conscious day. “Out of Sight, Out of Mind” was the first episode of M*A*S*H written by scripting partners Ken Levine and David Isaacs. 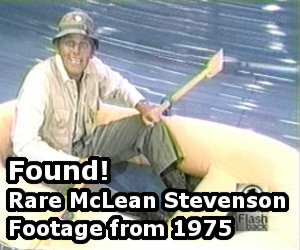 Levine has discussed the episode several times at his blog. In a a July 2007 post he explained how the two got the assignment and how they brought 50 ideas with them when they met with Gene Reynolds to pitch stories. 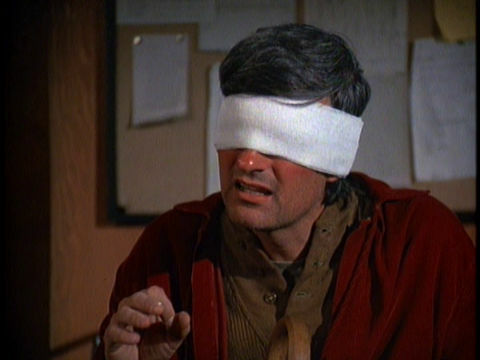 Two of them were later combined into this episode: Hawkeye losing his sight and Frank betting on baseball games heard over the radio (based on a story Levine heard). In an October 2007 post Levine recounts purchasing an expensive VCR to record the episode when it first aired. And in an April 2012 post he delves a little deeper into how the script was written. Levine and Isaacs consulted with a woman who worked with the blind and she blindfolded them and told them to try to walk up a busy street. Levine also pointed out in January 2010 that during the tag scene Lt. Gage can be seen reading JAWS–an anachronism, of course. And he revealed in January 2011 that Tom Shaw was named after a friend from high school who went on to become a scriptwriter as well. “Out of Sight, Out of Mind” marked the first appearances by Enid Kent as Nurse Bigelow and Judy Farrell (who at the time was married to Mike Farrell) as Nurse Able. Both remained with series through the final episode, with Kent appearing in at least 14 episodes and Farrell in at least eight. Bobbie Mitchell, on the other hand, made her final appearance on M*A*S*H in this episode. Her first appearance was in “The Army-Navy Game” during Season 1. She was in at least 18 episodes, credited as numerous different characters including Nurse Marshall, Nurse Lyons, Lt. Baker, and Lt. Gage. Tom Sullivan, who played Tom Straw, is blind in a real life. His 1976 autobiography If You Could See What I Hear was turned into a movie in 1982 starring Marc Singer. Father Mulcahy does not appear in this episode. Re-created baseball games were a major part of the broadcasting scene back in the heyday of the National Pastime. For a book that provides a good bit of history on the popularity of re-created games I recommend ‘The Crack of the Bat: A History of Baseball on the Radio” by James Walker. Many readers here may know this, but in case you are unaware, Ronald Reagan broadcast re-created Chicago Cubs games on WHO radio in Des Moines during his early career (1930’s). As to the episode, it is a good season 5 episode, but certainly not one of my favorites in the series. It earns higher marks due to the baseball aspects as I am a huge fan of the game. This is actually one of my favorite episodes, and it’s funny that this should happen to be the Episode Spotlight of the week, as I’ve been watching this episode quite a bit lately since the weather’s actually been cold and winter-like lately (we lost two-thirds of December to that Blowtorch Christmas pattern caused by El Nino, and it sucked). Levine & Isaacs may have jumped into the series a little later in its run, but they sure did pick up on the characters and their situations, as well as the overall tone of the series very well, as I’ve noticed many of my favorite episodes from Seasons 5-7 are coincidentally written by them. It’s a shame they left when they did, one of the reasons 8-11 aren’t too good is how Alan Alda and Burt Metcalfe overhauled the writing staff by that point to shift the tone of the show; Levine & Isaacs returned to write the “Good-bye, Radar” 2-parter (mainly because they originally wrote Radar’s farewell episode as the finale for Season 7), and those two episodes – while saddening because Radar is leaving – feel more in the spirit of the show in its first seven seasons. That said, despite Hawkeye’s dilemma, I really felt like this was just a fun episode all around, and it’s even better uncut on DVD, because there’s quite a bit that’s cut from syndication in this episode, such as Klinger escorting Hawkeye to the Latrine only to be escorted to the Mess Tent by Margaret (by cutting that scene, that means in syndication, Margaret doesn’t appear in this episode either, since that was her only scene) – also the ensuing bit of Hawkeye guessing what’s on his tray by smelling the creamed spinach and feeling the meatloaf is cut as well. Also Hawkeye discussing Tom Straw being an English teacher in San Francisco is missing, which makes the later comments about Hawkeye being the “new boy in his English class,” rather random and slightly confusing. As for Hawk’s other senses being heightened by his temporary lack of vision, it may be cliche, but I understand it’s accurate: while I don’t have any first-hand experience with the blind (other than a blind man bumped into me at the store one time because his caretaker wasn’t very good at maneuvering him), I’ve written for blind characters before myself, so I’ve had look into the subject matter a bit to understand it better, and it seems to me that blind people’s other sense – particularly sound and touch – are indeed heightened. Gary Burghoff even gave Radar glasses as a way of playing off his ESP and balancing his accute sense of hearing by having a poor sense of vision. This episode was very thought-provoking because Hawkeye expanded his horizons sense-wise. In case anyone was aware, Tom Sullivan sang the National Anthem prior to Super Bowl X.
Frank: Pierce, you disgust me. Hawkeye: That’s right, Frank. I discussed you with everyone I know,they all think you’re disgusting. I don’t recall if we see Frank’s radio in this episode (haven’t watched it in a long time), but radios of that era were commonly broadcast band plus several shortwave bands (in several episodes we see a very popular portable radio, the Zenith Transoceanic; it was one of the best, and still brings premium prices on the collector market). The camp transceiver, probably a Hammerlund or Hallicrafters built to military contract, was functional across the entire shortwave spectrum. So all Hawkeye, et. al., needed to know was the frequency of the station to which Frank listened, then tune the camp transceiver to that frequency; being in such close proximity, its signal would override the commercial station. I’ve never cared for this episode, not just because there is no drama involved in Hawkeye’s blindness, but because it is a “too much Hawkeye” episode. Not to mention why do the nurses call a surgeon, rather than a camp mechanic, to repair their stove? Especially when Hawkeye has admitted he has no mechanical aptitude; in a scene where nurse Kellye has to help him fix the autoclave, he states “The problem is, charm doesn’t work on machines”. Expanding on Ken Levine’s revelation about Tom Straw being a high school classmate of his, Straw worked on ” Night Court” for two seasons along with numerous other former ” M*A*S*H” staffers. 1) Frank is whistling “Three Blind Mice” as he enters the Swamp with Radar reading Hawkeye’s letter to him, and 2) Frank appears to be betting with greenbacks instead of military scrip. Watching the episode now, I think it is script, too gray and not long enough to be regular money. IMO. Nice catch on Franks whistling! Total Frank move to do that. Most of the serious stuff has been covered above, so I’ll mention a funnier part. You can tell how much Hawkeye means to Radar when Radar is trying to get the eye doctor to come. Normally he goes up the chain of command to impersonating a major / Lt. Colonel, but in this case he went straight to 3 star General! He wasn’t messing around at all. Radar’s demanding that Major Overman get to the 4077th was hilarious. Radar (authoritatively): This is General Walter O’Reilly, three stars and real mad. If Major Overman isn’t here by the time they crack my powdered eggs for breakfast, I’ll have you digging a latrine for every GI in Korea!!! Was that baseball game based on a real game? Why didn’t Hawkeye at least bring a flashlight with him?